They are two of kind; they are so… different. They are same. They are different. He is the father, and she, the daughter. Can they have a relationship? They are alike in a fundamental way: they have the same Temperament and Type. Different in other ways: male versus female, different generations, and different life experience. 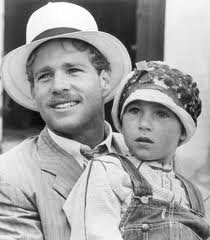 Co-stars in the hit movie, Paper Moon, the daughter, 10 years old at the time, Tatum O’Neal, won an Academy award for her performance, as a tough-kid in a father-daughter grifter team in the Depression. She was the youngest actor to get an Oscar ever. They were inseparable at the time, when Ryan O’Neal took care of her, because her mother and his ex-wife, Joanna Moore, was an alcoholic, and neglected to take care of her. “We were a team,” “we were very close; I was closer to her than any of my wives,” Ryan O’Neal has said. Ryan met Farrah Fawcett, the blond goddess, pop icon of the late 70’s and early 80’s. He was mesmerized. Tatum, at the vulnerable teenage of sixteen, felt abandoned. She moved out of Ryan’s life for 25 years. Tatum O’Neal married the combative “Tennis Brat,” John McEnroe, another bad boy, Crafter Artisan. They had kids, and Tatum eventually became a drug addict, ending up on heroin. Lost her husband; lost her kids. But she now is a recovered addict and alcoholic, trying to revive her relationship with her father. When they talk to each other, they can easily get mad at each other. Both can be very verbally combative. They tend give the third degree, to each other. It is hard for them to stop their verbal punches. They hate to “lose” — to give in to the willfullness of the other. Ryan was a Golden Gloves boxer as a kid, and has a “temper.” Tatum was affected by it, as a child, at least she feels so. She wants him to “take responsibility for it.” Not very introspective, and of the generation where therapy was for “nut cases,” Ryan does not want to be “told what to do.” But, Tatum is “feisty” also – she contends that it might help the relationship, she has had therapy and still attends AA twelve step programs. Both can be combative: Paper Moon was a real reflection of their real personalities – their Temperaments. Can two Crafter Artisans get along? It’s difficult – like two protons. But if they try hard enough, they can. The reality TV show, Ryan and Tatum: The O’Neals, on the OWN TV network, chronicles their reunion. If they understood Temperament – and the fact that they are more alike that they realize, a particular kind of “two peas in pod” – Crafter Artisans – they might have a better chance. Time and Temperament will tell. This was always such a sad story to me, their relationship. I didn’t know there had been a “reunion.” Both are Contenders–wow! There’s a recipe for conflict, period! What a Gift. The gift that keeps Giving.